Meteor showers happen often and can be seen at various times from a variety of locations all over the world. The most challenging part about watching meteor showers is knowing when they can be seen from a location near you. Here’s when you can expect to see the next meteor shower and what to expect. Once you nail down a time and a location, the next hurdle is making sure Mother Nature keeps clear skies above — so you can actually see the meteor shower! Believe me, clouds really can be a problem with meteor showers. 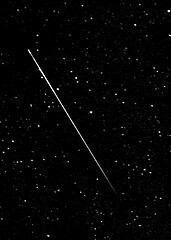 I have tried to view some meteor showers in the past but the sky got cloudy and I couldn’t see any meteors streaking across the heavens! Thankfully, there is almost always a meteor shooting across the sky somewhere, so if you wait long enough you will likely see one. FUN TIP: If you want to hear meteor showers, turn on your FM radio so that all you hear is static. Whenever a meteor shower happens, the ionosphere (where radio waves bounce up in the atmosphere) is ionized, temporarily allowing stations up to 1,000 miles away to be heard on your radio!